It is incredible how mothers give up on their dreams to support the marriage and carve a better future for an offspring after going through a 9 months life-threatening period and the labor room pain. Nevertheless, they still decided to take the risk so that a new generation of leaders is born therefore from mothers to great grandmas and every woman in the community; our profound gratitude should be loud enough to show them that we care. Why don’t you pay your dues by choosing inspiring messages from our collection to send to every important woman in your life on mother’s day to say thank you? Today is the day that I anticipated for a long time; it is a day to appreciate my mother for birthing me and showing me so much love. I pray every morning to God to grant you a long life so that we can spend many more mothers’ day on earth together. 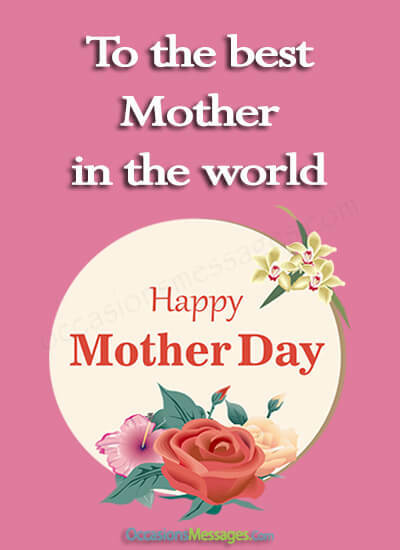 Any child with a mother like you would go crazy on mother’s day irrespective of their mood and worries. I cannot help the feeling. Nobody else can take your place in my life even after you are gone. However, I will always celebrate mother’s day to honor you. My darling angel should be happy on mother’s day. You mean the world to me and I will do anything to see that you remain happy. I am delighted to be your son, and I hope to marry a woman like you so my children will feel the same love I think. Happy Mother’s Day. Men are not always as strong as we look; sometimes we need a pat on the shoulder, which you do. I am so happy for Mother’s Day. I might be an angry and reckless son if you not showing me the peaceful side to life. You deserve a Mother’s Day every month. No woman can replace my mother, as also there is no one else who deserves my affection today because of its mother’s day. I feel an overwhelming pride whenever I remember that you are my mother. Thank God for being your son and for Mother’s Day. You alone should be the celebrant on mother’s day, and others should find another day. I hope to take after you when I grow up. Happy Mother’s Day. Mothers should equip daughters with every requirement necessary for womanhood; you did it with excellence. I want to thank you especially on Mother’s Day for bringing me into this fantastic world and showing me how to be a responsible woman. Mother’s day should only be for mothers who teach their daughters how to be an upright wife and professional. You thought me so much. You unconsciously taught me how to be a woman by just living with you and learning from your daily life. Have the best Mother’s Day Jubilee. Its mother’s day, which also makes it a day to be happy because I love you, mom. Mothers are everywhere but mothers that love as you are scarce even on Mother’s Day. We recognized Mother’s Day because of women like you who are beautiful beings. You are a good mother, wife, and daughter. You deserve the Mother’s Day love. Happy Mother’s Day to a woman that is just the best. How do I find you in my next life? I hope you receive all the love and comfort you can get on Mother’s Day. Cheers to the worthy recipient of the mother’s day award for excellence. Most of us do not believe you would ever become a mother and celebrate Mother’s Day because your looks are enough to scare anyone. Some people say that being a mother is an easy job, so I always tell them to note how old you look after a few kids. Happy Mother’s Day. You will receive different Mother’s Day messages, but we both know that you do not deserve it. The house cleaner does all the work. It is such a coincidence, funnily its Mother’s Day and I have always wanted to tell you how your awkward parenting makes me laugh. You deserve a Happy Mother’s Day for all the feasts and diaper you packed; I commend you for your selfless service. Mother’s day to me is as important as my birthday to me because I have the chance to celebrate the hero who gave me life. Every day is mother’s day to me, so today does not make a difference because you made so much sacrifice to qualify as an everyday celebrant. Most people observe mother’s day just for the hype of it, but I do because I acknowledge what a great mom you are to me. You are an inspiration to a good adviser and me whenever wants to make some hard life decision and you are always correct. Happy Mother’s Day. Superheroes do not always fly around wearing a cape; the real superheroes are women who deserve the entire mother’s day celebration. As a friend, it is my responsibility to commend your marvelous work on Mother’s day; there are only a few good women around. You are worthy of my admiration on Mother’s Day. The way you handle your family is perfect to a fault. Friends should be truthful to one another, so I have to applaud you for a job well done. You should have more than a Mother’s Day Celebration. Happy Mother’s Day, You are one of my few female friends who deserve every good thing for taking care of family and friends. Friends should be caring, supportive, and lovely. I am not surprised that you receive so much love from everybody on mother’s day. I would not be a good father without you in my life. You made parenting easy. I am happy about today’s Mother’s Day. You as my wife deserve admiration and appreciation on Mother’s Day for taking good care of the home and children. My world would be void without a spectacular wife to celebrate Mother’s Day. Today is all about you so enjoy it to the fullest. Happy Mother’s Day my Love. If all women were like you, the world would be a better place. I feel for men and children that have terrible mothers. You gave me the greatest gift, our children, so I will celebrate Mother’s Day as if I just received a million dollars lottery. I am proud to call you my daughter because you play an integral role in keeping your family happy. Happy Mother’s Day. My daughter is not just a worthy celebrant of the mother’s day; she is also astonishing in all her endeavors. I said a million prayers while you were young and God answered some like being as loving as your mom is. Happy Mother’s day. You as a daughter are one of my greatest achievements on mother’s day, and I am always grateful for the way you care for the grandchildren. May all the blessings associated with mother’s day come your way my dear daughter, have a beautiful day celebration in your little way. God gave me a good sister that whenever I see her, I see an upgrade of myself. Its mother’s day, so I decided to let you know. If there were a contest for the best woman on mother’s day, you would win without a doubt. It is just amazing that you are my sister. I will keep on celebrating you on all days, even on sister’s day and mother’s day because you are my darling sister. Who else deserves my applause on mother’s day other than my sister? It is quite amazing to have you as a sister. There is no doubt of your competence as my sister and your distinctions as a mother. Mother’s day is all about you. Hi grandma, you are the greatest gift to our family, which makes us happy every time we think of you. Mother’s day is yours. You will always remain special to me irrespective of mother’s day, and I intend to enjoy every moment that we have left. Nobody can argue that you are not the best grandma the heaven sent to earth. I am only a lucky beneficiary of your love. Happy mother’s day. Grandmothers are nicer than mothers because they are more lenient and spoil us with gifts. Happy mother’s day to you grandma. You will always be in my heart till my dying day, only grandmas with repute like you can claim this honor on mother’s day. Thank you, mother-in-law, for being like a mother to me in all ways; I celebrate you and my mom on this day because you are equally sweet. Everyone knows that we are very close and I intend keeping it this way after mother’s day. In my whole life, I have not seen many mothers-in-law of your type. Mothers-in-law should be as sweet as you should, so they will enjoy the type of love I will show you on mother’s day. You support me whenever I am correct, and your child is not, and then settle issues between us. Whom else will I want to thank on mother’s day. Happy mother’s day to a fantastic mother-in-law, you earned my respect from the first day we met. Anything you do for yourself on mother’s day should be perfect because you are a good friend and an ideal stepmother. To the world, you are my stepmother but to me you worth more than silver and gold. Happy mother’s day, I will always love you. You chose to take me as your child, so I also decided to make you as my mother. Happy mother’s day to the best stepmother in the world. I will always be indebted to you in this lifetime and another for directing me towards success. Happy Mother’s day to the best stepmother. The word stepmother should not be in the dictionary because it is trash. I do not care what everyone thinks. Happy mother’s day to you mummy. You will soon become a mother, so I welcome you in advance to the mothers club with a happy mother’s day message. The little child still holds on to you on mother’s day but cannot hold on forever; it is still your day so enjoy it on a low. Mothers-to-be are also mothers, so today’s mother’s day celebration is also for you. I hope your courage sees you through the labor room. You look terrific on mother’s day with the baby growing in you. You have my full support to be an amazing mother. Happy mother’s day. Give us the baby in your tummy already, so we can celebrate another addition to the mother’s club. It is quite amazing that you look healthy for a woman that recently birthed a baby, so I tell you congratulations on your mother’s day wishes. I wish you a new baby every mother’s day to keep today’s tradition alive; it is so sweet that you have a newborn and a family to celebrate mother’s day. Celebrating mother’s day with a newborn is a positive omen for any woman. It is your time to have a beautiful day. Lots of love to you on mother’s day for having a baby to celebrate with you. Thanks for the fantastic stunt it was quite timely. I love the excellent sound in a home like the newborn baby’s cry. Please permit me to come over to spend mother’s day with you. I wish I were over there to celebrate mother’s day with you. However, I teleport the blessings attached to the day over to you. Happy mother’s day to you. The distance between us will not change the fact that you are a phenomenon being and an outstanding woman. It is impossible to forget you on mother’s day because life is better whenever you are around, but I know you will enjoy. We might be hills and valleys away, but despite the distance, I still feel your warm comfort on mother’s day. I pray that on the next mother’s day we will be closer and roam around town from the dawn to dusk having a good time. I promise you on mother’s day that I will love no other woman but you. You are all I ever wanted in this life and after. I will cherish and honor you as long as we remain friends, so I will start today by saying a mother’s day congratulations to you. We will enjoy an amazing mother’s day celebration with you at the mother’s party. Your parenting will be flawless because you showed a lot of commitment towards the birth of the child so happy mother’s day to you. The absence of wonderful mothers like you shows when distance separates you from us nevertheless we want you to enjoy mother’s day still. Love is all I feel for you on mother’s day, many of my mates wish for someone that has your spirit, but you are all mine. What a way to celebrate mother’s day with a Baby in your tummy. You are a wonder, and you act for the cameras too much. Some stepmothers are next to the devil in term of character, but you are the direct opposite. Happy mother’s day. Anytime I see you, I see a prototype of Mary, the mother of Jesus. To a mother-in-law that is so caring and harmless. Happy mother’s day. You should get an accolade for the exploit you played from my birth until mother’s day. Nobody else performed better than you did. I say a big sorry to you on mother’s day because I told God that I do not want to look as frustrated as you do when I have kids. Which girl would not pray relentlessly for a guide like you, I guess no one. I have to do a double Mother’s Day celebration because you are also my mother. The future holds many possibilities but there is only one option for a son like me on Mother’s Day, and it has to acknowledge you. Happy mother’s day to my lovely sister, that kept me happy since we were little children until today. I am amazed by the outstanding job that you do as a mother; only a daughter can be so good and worthy of my praise on mother’s day. This entry was tagged Happy Mother's Day, Mother's Day Messages, Mother's Day Wishes. Bookmark the permalink.